What they do all day? When deciding which firm to hire for a construction project, one of the biggest factors is cost. Construction estimators calculate the price of time, labor and materials for a specific job, and then put together a bid. For new entrants to the field, that might involve blueprints, pencils and a calculator. For senior estimators, or those working at a large company, software does most of the heavy lifting. How to get the job? Many estimators come straight from the construction industry, where they were foremen or superintendents, and learn the ropes on the job. Others use a degree in construction engineering or construction management as a launchpad into the field. Analytical skills and the ability to make quick decisions are a must. What makes it great? Not only is the money good, there's also an increasing call for estimators as companies make more of an effort to keep costs in check, which brings job security. What's the catch? The day-to-day work involves staring at blueprints and a lot of math. Bid deadlines can be stressful, and the pressure to neither over- nor under-bid can be intense, especially when construction projects are notorious for going over budget. --K.A. Note: An earlier version of this profile said there is no college degree for this job. 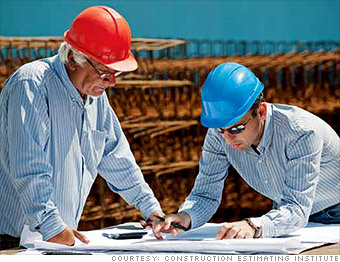 Do Construction Estimators have great jobs, or what?